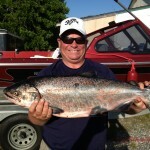 Dan Browning joined Mike & myself to catch this awesome Chinook on 7/11.”. 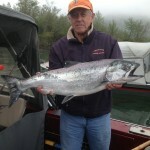 Guide Les Craig releasing this beautiful Wild Spring Chinook on the Rogue…May 30th…”come back in two days please”. 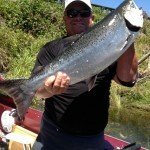 Gail likes Salmon fishing with guide Les Craig…oh brother!. 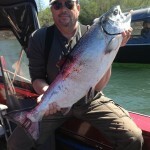 Jon caught a beauty …spring Chinook are the best !! They both fought hard… but Mike won. 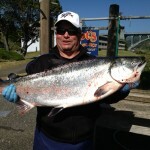 Tough Guy! 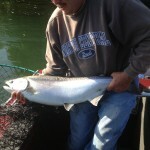 Mike caught this beauty just above the bridge while fishing with Dan & myself. 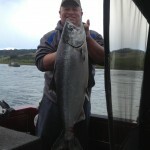 Mikey likes his new Spring Chinook Salmon…hey Mikey! 4/12/12. 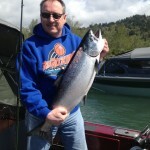 Jon’s Dad Ron couldn’t let Jon out fish him…Spring Chinook in the boat…awesome ! 4/12/12. 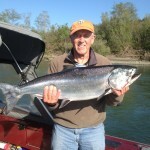 Ron had to return for another Spring Chinook on the Rogue. 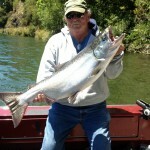 Mike Wilson caught this “fatty” on a lazy Sunday afternoon…awesome !! 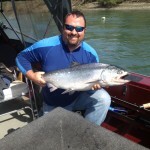 Mike Wilson is cleaning up on the Rogue Chinook Kings. 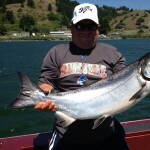 One adult and one jack for Mike today…and tomorrow it continues!!!”. 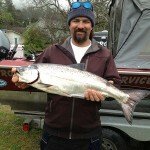 JC Martinez landed a nice Spring Chinook. 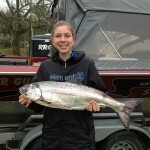 Miss Martinez upstaged her Dad with a Spring Chinook bigger than his.